About a month ago, I was talking with some of the women on our team about some of my struggles. They prayed with me and encouraged me, but they also suggested that David and I take a weekend away, just the two of us. Corinne even offered that she and her husband, Daniel, could stay with our kids. Soon after that, Corinne and Daniel told us a particular weekend that would work, and I began to make plans. 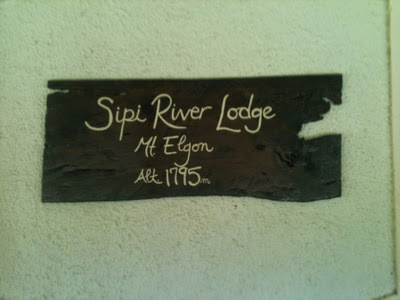 We had heard that Sipi Falls in eastern Uganda was a beautiful place, so I started doing a bit of research. 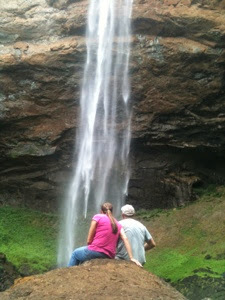 On Friday afternoon we drove east heading toward Sipi Falls. It was an adventure as there are very few road signs here. Several times we stopped to ask strangers for help, praying that they speak English. The languages here in the east are different from those in the central region. Uganda has so many different languages. After a beautiful 4 hour drive, the last hour was a drive up into the mountains. We arrive at the beautiful lodge just in time for a delicious meal with a cozy fire in the fireplace. It was actually cool enough to need a sweater and to enjoy a cup of locally grown coffee beside the fire. We spent much of the weekend hiking to waterfalls and enjoying the beauty of this part of creation. It was a very good time for us to reconnect and and unwind a bit. The hiking was also some great exercise. We are both a bit sore. As we went on our final hike of the weekend, we headed to the upper loop. When we got to the ridge along the top of the mountain it was so beautiful! 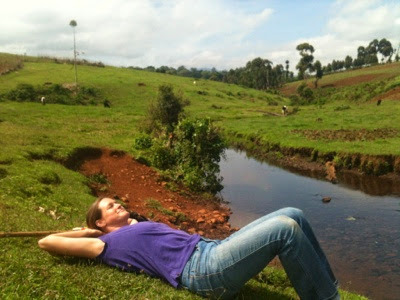 We could look out over so much of eastern Uganda. 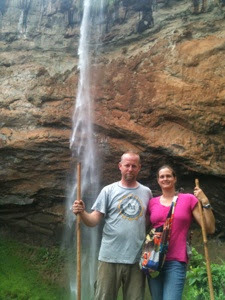 We also walked a ways up the stream that leads to the 3 waterfalls that make up Sipi Falls. It was such a peaceful area. Psalm 23 came to mind. As I continued the psalm in my mind, I thought about the ongoing pain in my tongue and my struggle with fear. It was good to remember that I can have peace, not only on the mountain top, but also in the valley, because God is with me. I am so very thankful for this weekend of refreshment! We are on our way home to return to the work of teaching the missionary kids, caring for our family, loving the children of GSF, and reaching out to those in our local village. Please pray that God would continue to strengthen us for the work he has called us to and enable us to serve Him and those around us in love. In the midst of the stress of life, my struggles with fear, and seeing the utter brokenness in the world, I want to serve others in love, remembering the love my Heavenly Father has shown me, remembering that He restores my soul, and remembering that He is always with me. I pray these truths encourage and strengthen you for the work God has called you to do too!